Like the other Divisions, the Turian is young and therefore hungry to leave its mark on the Preconstructed Championships world. 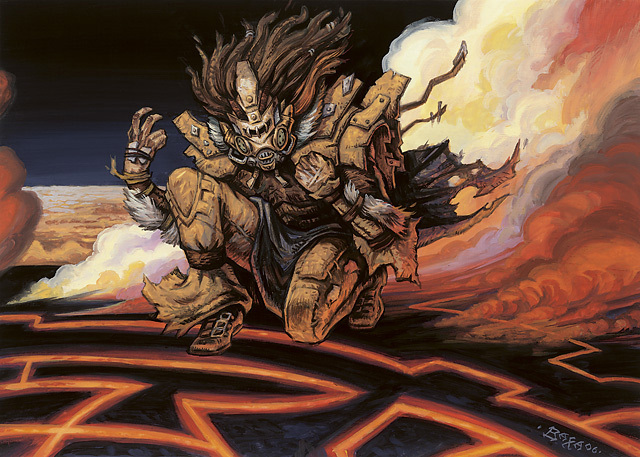 In its short history already it has found glory in the 2008/09 season as Dead Ahead powered past Jace’s Duel Deck to claim the title. In all other seasons, however, the laurel of glory has been clutched by the Lauer Divsion, which itself went on to see Elspeth’s Duel Deck take it all in the 2010/11 season. The Turian might be forgiven, then, for feeling a bit like a younger brother, and understandably eager to get out from the Lauer’s shadow. Traditionally it is here that we’ve given a deck-by-deck breakdown of the division, but this time we’ve made a chance and are presenting that analysis in the mid-week Prediction League update post. Our first match pits another of Ninth Edition’s 40-card mono-colour decks against a known powerhouse of Coldsnap, the death-trigger-filled Beyond the Grave. Next in a fratricidal clash of Time Spiral decks, we’ll see if the Saproling and Thallid armies will have what is needed to stand up to the currents of time itself when Reality Fracture takes the field. Our third feature match finds our first Ravnican guild of the day, the Gruul, as they try and use blunt force to get past the very delicately-tuned instruments of Suspended Sentence. Finally, in one of this season’s most unfortunate draws, the mill-reliant Dimir Intrigues faces down a deck that loves to see a full graveyard, the reanimating Rituals of Rebirth. Which decks will see glory today, and which will wallow in ignominy? Let’s find out! Lofty opens with Telepathy, an annoying although not directly harmful enchantment that forces Beyond to play with its hand exposed. Lofty notes with particular concern Beyond’s Dark Banishing and Krovikan Rot, then drops a Kraken’s Eye before a Sleight of Hand. It then plays an Aven Fisher which draws the Rot. Beyond is far from idle throughout all of this. It opens with a Gutless Ghoul and a Coldsteel Heart, and has land drops for days. It sticks a Casting of Bones on the Ghoul, then cashes it in after an attack. This lets it both refill its hand as well as bring back the Krovikan Rot. Lofty stalls the board a bit with a Puppeteer, while Beyond starts weaving its intricate web of creature sacrifice and recover, powered by a Gutless Ghoul and Insidious Bookworms. Meanwhile, it starts chipping in for damage with an Ashen Ghoul. Once it gets its recursion engine into play- use Grim Harvest to get the Worms back to hand, replay them then sac them to the Gutless Ghoul, then use recover to get back the Harvest, it’s a virtual soft lock with Beyond’s life total creeping ever upward and Lofty unable to build a hand. As more mana comes it in manages to do more and more of its lock in a single turn, and death for Lofty comes with a Balduvian Dead’s 3/1 Graveborn token for lethal. This time it’s Lofty’s turn to play to its game with a Puppeteer followed by an Archivist and Horned Turtle. It then thwarts Beyond’s attempt to land a Casting of Bones on an Ashen Ghoul with a timely Boomerang, and begins outdrawing its opponent two to one. Still, blessed with abundant land Beyond manages a Gutless Ghoul and Void Maw, getting in some extra damage when Lofty taps out for some extra bodies. Still, Lofty manages to stabilize, using its Puppeteer to neutralise Beyond’s worst threat, though an Orcish Bloodpainter eventually arrives to knock out the Archivist. It’s immediately joined by a Skull Catapult for the Puppeteer, which seals Lofty’s doom. With five bodies built up in the netherworld for its dining pleasure, it bloats to gargantuan size and Lofty must gang-block with most of its board just to stay alive. This, of course, restocks the larder for the Void Maw, which goes in for easy lethal the turn following. Fracture opens by suspending a Riftwing Cloudskate, then suspends an Errant Ephemeron. Fungus, on the other hand, floods the board with some early slow-growth options like Deathspore Thallid, Thallid Shell-Dweller, and Thallid Germinator. Though able to keep some of the spore-growing in check with Clockspinning, Fracture’s only real-time defender- the Clockwork Hydra– gets Krosan Gripped. Once the Thallids land the Savage Thallid, with the option to pump, shrink, or regenerate on the board, Reality Fracture can’t hold back the tide and after drawing a little bit too much land, soon falls in the opener. This time it’s Fracture’s turn to establish a strong board position from the outset, but it takes every trick it can muster to break even. It leads by suspending a Deep-Sea Kraken, which has a chilling effect on a Fungus board which at that point had only managed a Thallid, though both sides had deployed Claws of Gix. Fracture then suspends a Riftwing Cloudskate, and kills off a Thallid Germinator with a hardcast Rift Bolt. It again keeps the spore count low with Clockspinning, though at one point it has to respond to a Thallid Shell-Dweller by Clockspinning a counter up on the Deep-Sea Kraken, just to keep it from hatching a turn early. All this work pays off as both suspended beaters come into play, and that sets up a triple-strength Ignite Memories for a total of 10 damage. After that, it’s back to détente as each rebuilds their board. Fungus adds a Sporesower Thallid and Wormwood Dryad, as it picks off the Riftwing Cloudskate with a Sudden Death. Since one of the revealed cards was an Assassinate, Fracture holds its Kraken back waiting for a lethal blow, but lands a Giant Oyster and Viscerid Deepwalker. Fungus, at 8 life, then plays Dread Return to bring back the Germinator after Fracture has cleared some space with a Ground Rift (faltering the 4/4 Sporesower) and killing two more 1/1’s with a Grapeshot. That leaves Fungus with three mana up- and vulnerable. Fracture plays Clockspinning on a Thallid, then follows it up with another Ignite Memories, hitting twice thanks to storm. With the Assassinate and a Krosan Grip in hand, Fungus takes 6- and is just shy of breaking even with the Claws of Gix when the Kraken is finally unleashed, taking the game. Fracture leads with a suspended Viscerid Deepwalker, then follows with a suspended Riftwing Cloudskate. Fungus begins with a 1/1 Saproling token thanks to Sprout, then a Pendelhaven Elder and Wormwood Dryad. Fracture then solves the latter two with a Serrated Arrows, which draws a Krosan Grip only after two turns of use. Fungus never recovers. Fracture hardcasts a Keldon Halberdier, then plays a Clockwork Hydra alongside a Sage of Epityr. An Ignite Memories following a Claws of Gix is an easy six damage, and Fungus must Dread Return the Dryad to buy itself time. It doesn’t matter- even with a Claws of Gix, the damage output of Fracture is too great, and it advances to the next round. The Gruul lead with a Gruul Guildmage, getting in some early beats while Suspended Sentence suspends a pair of Infiltrator il-Kor. Gruul Wilding then adds a Dryad Sophisticate which gets traded out with a Deadly Grub, and a Gruul Scrapper gets its hasted attack in before falling to an Ichor Slick. While Suspended Sentence gets the Gruul down to 5 life, its slower start means the result is inevitable, and Sentence quickly falls. This time the Gruul stumble out of the opening gates. It plays an early Sparkmage Apprentice, then drapes it with auras- Fencer’s Magemark, Beastmaster’s Magemark, then Fists of Ironwood– en route to playing its more expensive cards. Suspended Sentence, however, isn’t giving it the luxury of time. It leads with a pair of morphlings- an Unblinking Bleb followed by a Timebender, then it Ichor Slicks a Bloodscale Prowler. Phthisis gets suspended, and between the Timebender and Clockspinning it pops much earlier than aniticipated, hitting Gruul for 6. Gruul has little it can do, and falls in short order. This time the Gruul aren’t playing around, as attested to by an early Gruul Scrapper followed by a bloodthirsted Scab-Clan Mauler. However, Suspended won’t go down without a fight, first suspending a Riftwing Cloudskate followed by a morphed Zoetic Cavern. It then suspends a Festering March and looks to buckle down. The Gruul then add a bloodthirsted Bloodscale Prowler after the Scab-Clan Mauler is first bounced by the Cloudskate then stuffed back into the library with a Lost Hours. Then Suspended Sentence springs the trap. Festering March comes out of suspend, giving the Gruul’s Scrapper and Prowler -1/-1 until end of turn. Suspended then plays a second Festering March from hand, wiping Gruul’s board. Both cards go back into a suspended state, promising a lethal -2/-2 pulse every third turn. Suspended Sentence continues beating in unopposed, sorting out an Indentured Oaf with an Ichor Slick before hardcasting a Nihilith. That forces a Gruul capitulation, and Suspended Sentence takes the match! With a mountain to climb from the outset, the mill-heavy Dimir try and balance advancing their game plan without giving too much aid to the enemy. Unfortunately, this isn’t helped much when they get stuck on two Islands, needing to tap into the services of a Lore Broker to delve for land. This gives Rituals plenty of time and resources to get set up, first with an Essence Warden and Greenseeker, and soon with plenty more. While the Dimir struggle, Rituals dumps Teneb, the Harvester and a Havenwood Wurm into the graveyard. It then lands a Sengir Autocrat, allowing it to begin swinging for damage. The Dimir land a second Lore Broker and desperately loot for land. Figuring there’s enough fat in the graveyard already to worry about, they play Consult the Necrosages to wipe Rituals’ hand, only to see Rituals topdeck a Harmonize and refill it. Eventually, Rituals finds a Dread Return and pulls Teneb from the graveyard followed by a Jedit Ojanen of Efrava that it also managed to dump to a Greenseeker. The Dimir secure a singular triumph- Disemboweling Teneb- but soon die to a horde from Rituals, which ended at 34 life. The Dimir get off to a much improved start this time around, with the land coming as needed. It leads with a Dimir Infiltrator and Lurking Informant, then Consult the Necrosages to pad its hand. Kicking things off with Search for Tomorrow and adding Greenseekers and a Fa’adiyah Seer, Rituals ramps quickly and soon hardcasts Phantasmagorian. Deciding that having a pair of Psychic Drains are next to worthless, the Dimir add in a Belltower Sphinx to counter the Phantasmagorian through discard. And there you have it! Four decks are primed for next week’s showdown, and by the end only one of them will be contending for Forsythe Conference glory and a chance to win it all. Stay tuned for this week’s Prediction League update, where we’ll see how everyone did picking the winners with the hope of winning the overall prize package! 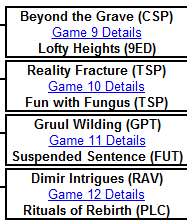 Shocked Grave one, but the rest looked like fun matches. 3-1 for me this week. Definite buyers remorse of picking Lofty, I went back and reread the deck breakdown and games for Beyond and still picked against it. You have failed me for the last time, 9th Edition. Send 9th Edition to the Bog of Eternal Stench. My gut has been relocated there. Great, only 1 correct 😛 I doubt I’ll end up in the top (X), but I’ll keep on trying! 2 for 2, like clockwork. Was hoping at least one Ravnica Block deck would make it to the second round, but sadly, it was not to be. I continue my trend of 2/4 for the first round in each division. Woo.